The annual celebration of Lynfield College's extra-curricular life was once again outstanding in highlighting the breadth and depth of talent, ability, and leadership amongst our senior students. Music ensembles, cultural groups, student leaders and sporting stars came together in an occasion which will be memorable in the students' lives. Arts and Culture Captain Oksana Zhang has written this account of her special time at Festival Awards Evening..
An instrument is nothing without its musician and a sport field is nothing without its sports players. Held cordially at Eden Park the Festival Awards made the perfect denouement for a victorious year of arts, music and sporting achievements of Lynfield College. The ceremony kick-started with a powerful haka performed by a mix of the Kapa Haka group and the Student Executive. After Mrs Walbran, the Director of Sport and Mrs Wagner, the Arts and Cultural Coordinator acknowledged the award-recipients, they shone the spotlight on to the Captains. Arts and Cultural Captains Oksana Zhang and Jairah Perida and Sports Captains Adeleena Lee-Hussien and Cree Braithwaite who spoke about their experience of representing the school, and the Awards ceremony smoothly led on from there. The arts, music and cultural groups saw an overwhelmingly successful year, including the huge hit musical production “Popstars” making it in to the Herald, Big Band and Jazz Bands rounding up all the top awards in music festivals, and our very own “The Flock” band making finals in the “Stand Up Stand Out” music competition. To prove the outstanding musical talent we have here at Lynfield, our young yet professional musicians Jake Krishnamurti, Sarai McKay and Dylan Goodisson performed ‘Special’ by Six60. My Bovaird then highlighted the importance of giving everything a go because you will never discover your true potential unless you try. Special acknowledgements were also dedicated to Mr Chris Wadsworth and Mr Aiden Halligan, both of whom devote utmost passion and time to the Human and Environmental Rights Committee. The second half of the ceremony began with an upbeat and dynamic montage that displayed our defining arts, musical and sporting moments, and boy was there a lot! This year our guest speaker was one of our own. Involved in more activities that can be counted on fingers, it was fitting that she was one of the runners up Dux Artrium of the year. A natural public speaker and debater, Gauri Prabhakar delivered an empowering and evoking speech and proved that the impossible is indeed possible. 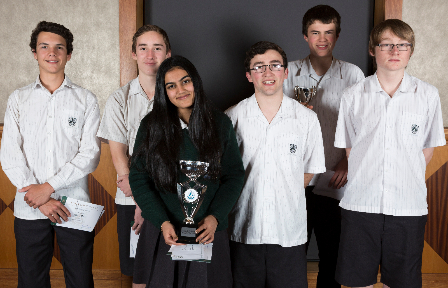 Winning the Race Unity Speech competition and being selected as one of the 22 student delegates to represent New Zealand at the United Nations in The Hague, she spoke from experience about how to overcome obstacles that we may face in our high school journey. The ceremony ended with the presentations of awards to those who displayed exceptional contribution and success.. Lynfield’s Jazz Combo directed by the legendary Mr Norman led them to victory and earned the well-deserved “Group Achievement Award”. The Robotics Team took out the title of the “Team of the Year (non-sports)”, out-competing over 600 teams over 38 countries for the third year in a row, with the average age of only 16! 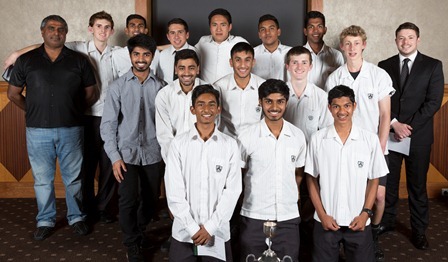 Sports “Team of the Year” went to the 1st XI Hockey Boys team, who were coached by Dux Ludorum 2013, Akshay Chauhan and led them to consistent wins. 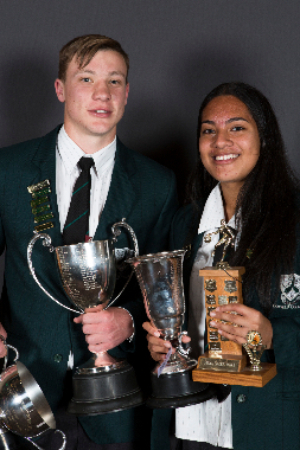 Dux Ludorum went to Sports Captain Cree Braithwaite and Assistant Sports Captain Akanesi Fakafanua. Phenomenal trumpeter, trombonist, euphoniumist and flugelhorn player Jake Krishnamurti was titled as Dux Artium, while the Arts and Cultural Scholarship went to Arts and Cultural Captain, Oksana Zhang, as well as the “Service to the Performing Arts” trophy. While Festival Awards may be the closing ceremony for this year of arts, music and sports, it is only just the beginning of many more successes that Lynfield has yet to achieve. 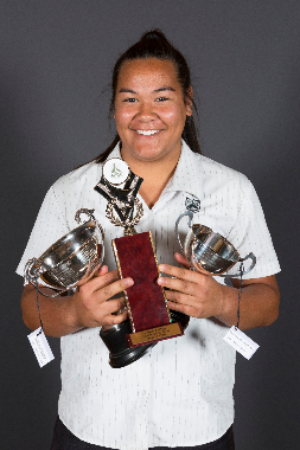 Akanesi has represented the school in the top basketball, volleyball, and tag teams as well as Premier and UNISS Netball teams – this is typical of her sporting involvement since Year 9! She was a member of our very successful Senior Girls Volleyball team which won the Division 1, Central Auckland competition and finished 12th in Greater Auckland. She is the assistant female Sports Captain this year. A talented all round athlete whose love of sport has been obvious since Y9, Cree is a natural leader who has always chosen to lead by example. He is a member of the 1st XV rugby team, a representative Tag player, and captain of our Premier League team. He has organised House Competitions and assisted with the running of Athletics Day and the Road Race. Jake is a talented and outstanding musician who excels on trumpet, trombone and euphonium in both jazz and classical genres. He is a member of the Concert Band, Big Band, Jazz Combo, Symphony Orchestra, Chamber Orchestra, Soul Jam and Production Band. This year Jake was selected to play lead trumpet with the NZ Youth Jazz Orchestra (U20 years of age). At the NZ Youth Jazz Festival he was part of the group that won Best Jazz Combo and he also won the award for Best Original Composition. At the Auckland Jazz Band competition, Jake was a member of the winning jazz combo and also won the only individual award for best jazz soloist. Jake plays lead trombone in the Lynfield Big Band which won Most Outstanding Jazz Band at the KBB Music Festival this year. Outside of school he plays with Queen City Big Band, and has already played a number of professional gigs on both trumpet and trombone. A talented performer, Sarai was the Vocalist in two very successful bands this year: Big Band and The Flock. The Flock was Rock Quest's Auckland Central Finalists, Stand Up Stand Out finalists, and NZ Songwriting competition finalists- and Sarai wrote the lyrics for their original songs. Sarai represents the Kapahaka group at Polyfest with tremendous pride. She has been an inspiring leader of the Maori group, including organizing the Haka performed by our school leaders at festival AwardsEvening. A talented trumpet and piano player, Dylan was a member of Big Band, who were the Auckland Jazz Band Festival winners, and also took out the top honors in their category at the KBB Music Festival. He was also a member of the Concert Band, Jazz Combo, Symphony Orchestra, Chamber Orchestra, Soul Jam, Production Band and The Flock. 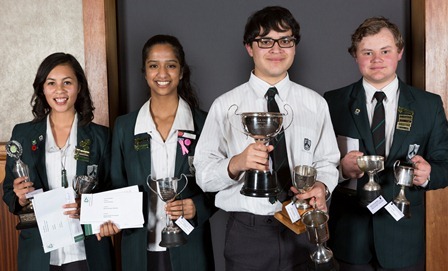 He was the Winner of Most Outstanding Trumpet Player at the NZ youth Jazz Festival. Gauri has been a committed member of Senior Debating and the Human and Environmental Rights and UN Groups here at Lynfield. You will often find her in the weekend leading a cleanup of some stream in our community, and she helped lead the sustainability initiative for Cultural Day this year. Outside of Lynfield, she has done 'hands-on' development work in India. She was an MC for Green Jam sustainability workshops, and was selected by the Ministry of Youth and Development for the 2015 Youth Week 'Changemaker' award. She was the Auckland Region winner for the Race Unity Speech Award, and has been selected for the New Zealand delegation to the Hague to represent United Nations Youth. At the Greater Auckland Athletics Intermediate Girls Shot Put she broke her own record 3 times before winning the event with a record throw of 15.38m which was better than the winning senior! Won gold in Intermediate Girls Shot Put at the North Island Secondary Schools Champs setting a new record (15.35m) which broke Valerie Adams’ long standing record for this event. Again, her throw was better than the winning senior! Won Gold in the Auckland Athletics Champs, again setting a new record, and again beating the seniors! Won Gold in the U16 Shot Put at the Australian Athletics Champs. Was 1 of only 6 athletes selected to represent NZ in the World Youth (U18) Athletics Championships in Colombia in July. She finished 17th in a field of 35. Maddi epitomises the well balanced high achiever and is an excellent role model in all she undertakes. We wish Maddi well when represents Lynfield College in the NZ Secondary Schools athletics championships early in December. Holly has used her athletic talents in a number of teams this year. She was a member of the Senior Girls Touch team and receives Colours for Touch and was the Most Valuable Team Player in this team. She is an excellent sprinter and is the Senior Girls Athletics champion (for which she receives the McMahon Cup) and she competed in the Central Zone Athletics champs. Holly is also a member of the 1st XI Girls Hockey team, Senior Blue Netball team and the Senior Girls Tag team. She has managed this alongside being an enthusiastic House Captain for Zorocich. Kiriffi is a gifted athlete who has natural skills in a wide variety of sports. He was a member of the 1st XIII Rugby League team and named Most Valuable Team Player for this team. In the summer, Kiriffi played Touch, Volleyball and Tag and Senior Boys tennis team. He was named Most Valuable Player of the Senior Boys Touch team (receiving the Boys Touch Rugby Cup) and the Senior Boys Volleyball team (receiving the Boys Volleyball MVP Cup). Kiriffi also receives Colours for Touch and Colours for Volleyball. In between trainings and games, he has been an enthusiastic House Captain for Fatialofa and is now helping coach the junior boys volleyball team, for which he receives a Service to Sport award. Andrew Isdale has enjoyed success in a number of areas. He is the runner-up Year 11 Boys Tennis Champion and runner-up Year 11 Boys Tennis Doubles Champion. He receives Colours for being part of the Robotics team that won the World Championship. But it is in Music where he particularly shines. 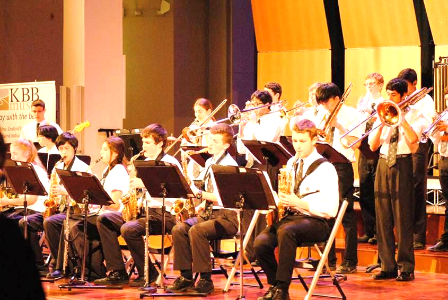 A talented saxophone, guitar and piano player in both jazz and rock genres, Andrew was a member of the Concert Band, Big Band, Jazz Combo, Chamber Orchestra, Production Band, Soul Jam and The Flock (many of these groups enjoyed success in either a Regional or National level.) He receives Colours for The Big Band and Jazz Combo and he is the Year 11 Musician of the Year. Ryu is a talented clarinet, drum and violin player who confidently performs across jazz, rock and classical styles. He was a member of 9 musical groups including the Clarinet Trio, Production Band and Soul Jam. Ryu receives Colours for the Chamber Orchestra, String Octet, Concert Band and Symphony Orchestra. He receives Colours with Hounors for Big Band and Jazz Combo, as well as Most Valuable Contributer to Big Band. Some of these groups have won Auckland and/or NZ finals for two years running, and Ryu won Most Outstanding Drummer at the NZ Youth Jazz Festival. We are proud to announce that Ryu is our Year 12 Musician of the Year. Nathan is a committed and dedicated athlete who has been involved in 3 sports this year. He was Vice-Captain of our 1st XI Boys Football team and receives Colours for football. He receives the Peter Clark Cup as he was named Most Valuable Team Player of this team. Nathan is the Y11 Athletics Champion (receiving the Intermediate Boys Athletics Cup) and represented our school in the Western Zone Athletics championships. He was also a member of our Senior Boys Tag team. Maddison is our Y11 Girls Athletics champion and receives the Y11 Girls Athletics Champion Cup. She has represented our school at Western Zone, Greater Auckland and North Island level where she had success in the Shot Put. For this she is awarded Colours for Athletics. Maddi was the Most Valuable Player in the Senior White Netball team and was also a member of our UNISS netball team. She receives a Service award for managing both our 2 U19 Boys Basketball teams.